As per the statement issued late last year by the Indian Telecom Minister – Sri. Ravi Sankar Prasad, panic alert buttons have been made mandatory in all phones sold in Indian markets. The rule has been imposed since 1st of January, 2017. While mobile manufacturers are still trying to make design changes to suit this need, the general public and officials see this as a welcome move. With crimes and attacks against women in particular, showing a rise, this is certainly a step in the right direction towards ensuring security. In addition to panic alert buttons, inbuilt GPS modules too will be a compulsory feature in mobiles sold in India. The Telecom Minister stressed that technology is something that is meant to make human life easier and secure and that this was one of the ways in which we could actually achieve it, especially for the safety of our women. The idea of a panic alert buttons was proposed simultaneously by the public and officials shortly after the Delhi gangrape and murder case happened in late 2013. Many felt that such a system may have saved the poor woman’s life. The Nirbhaya incident, as it was called, sparked widespread panic and associations that supported women’s welfare and other similar causes stepped forth to seek Govt. support to set up the necessary framework to enhance women’s security. With the Government’s support, the Nirbhaya fund was set up which further powered various other initiatives like the tie up with police and mobile service provider to dole out immediate assistance to women in danger. 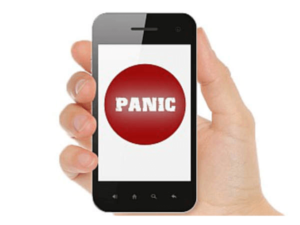 The panic alert feature in cell phones is one that was unanimously supported by officials and the general public alike. It is a relief to see that it has been implemented without much delay. As citizens, we need to understand that we don’t all have personal guards or Z-level security. We could easily be in situations that require help from emergency services and family. This could be a feature that would save your life one day. As of now, the feature is designed in such a way that a long press on the keys 9 or 5 would initiate a call to invoke an emergency service. In case this cannot be programmed into the phone, the power on/off button should invoke the emergency call when short pressed 3 times. While it would have been nice to have a dedicated button for the purpose, the fact that it could be accidentally pressed raising a false alarm deterred the phone companies and the authorities. However, many have expressed that they feel that this is not sufficient. Because the panic button alerts only officials and emergency services and not kin, the feature seems incomplete to many. It’s simple. The ADDA app. The ADDA ERP & Admin app is something that is designed to manage activities inside an apartment. MCs from 1200+ apartment complexes from around the country make use of it to manage their societies. While the ADDA app is for the residents to communicate with themselves and the staff. It is hugely popular across the country with 18500+ apartments already using it for internal communication. As opposed to emergency services, these are people who are in your immediate vicinity and are therefore, capable of taking immediate action. As you may already know, ADDA is dedicated to improving life inside apartment complexes. If you don’t use it already, we strongly recommend that you try it out. Visitor management, guest notifications, Panic Alert, parking management, accounting, accounting, and billingand billing etc are some of the features that we have.